Welcome to the Chapel of St. Mary’s Seminary and University which is dedicated to Mary’s Presentation in the Temple, the patronal feast of the Society of St. Sulpice. This page will give you a deeper appreciation of the architectural beauty of the chapel and its detailed spiritual symbolism. It is the very center of the life of the seminary. 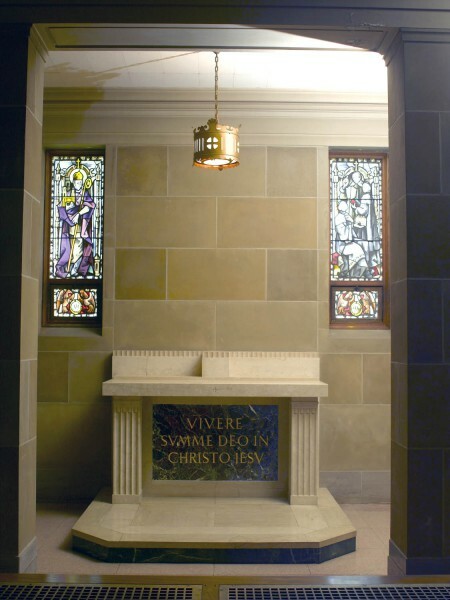 The Christological, Marian and Priestly motifs adorning the chapel, as well as the many Latin inscriptions within it, were all chosen by the Sulpician Faculty of St. Mary’s, under the leadership of Father James A. Laubacher, P.S.S., who was rector at the time of its construction and completion in 1954. When St. Mary’s Seminary and University in Roland Park was dedicated on November 5, 1929, the chapel had not yet been built. A drive to raise funds was immediately initiated by Father John Fenlon, P.S.S., Provincial of the Sulpicians and President of St. Mary’s. 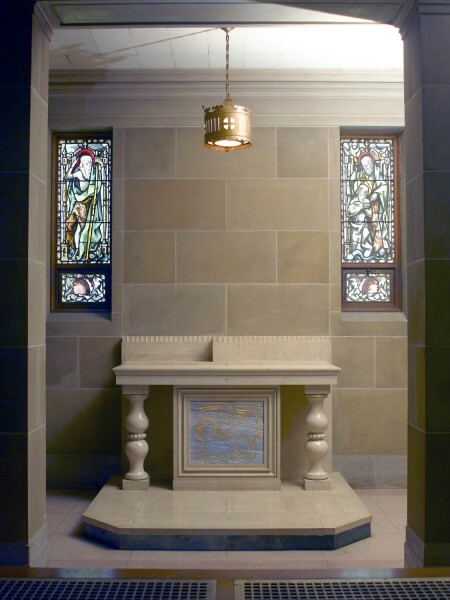 The Boston architectural firm of Maginnis and Walsh, which had designed the main seminary building, was commissioned to design the chapel in an Italian Renaissance style. However, the stock market collapse and subsequent Depression halted any building efforts. 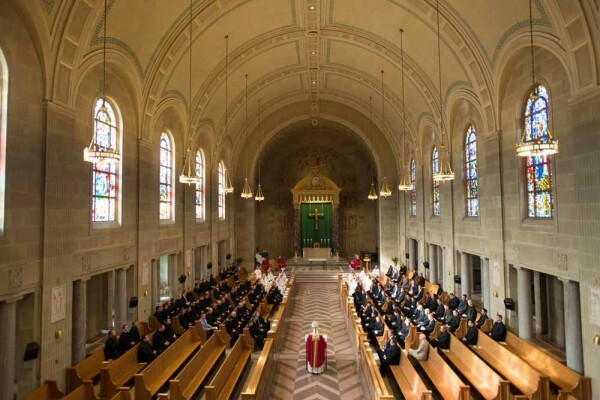 For the next twenty-five years, the community of seminarians at St. Mary’s worshipped in a temporary chapel which was later called the Prayer Hall. In 1989, its name was changed to Laubacher Hall. In 1941, St. Mary’s was ready to commence construction of the new chapel. Ground was broken during the summer and construction of the foundation proceeded rapidly over the next few months. On November 6, 1941, Archbishop Michael Curley of Baltimore presided over the laying of the cornerstone which was held during the joint celebration for the tercentenary anniversary of the Society of St. Sulpice’s founding (1641) and the sesquicentennial anniversary of the arrival of the Sulpicians in the United States (1791). A month later, construction on the chapel ceased with America’s entrance into the Second World War. Another twelve years passed before work again resumed in January 1953. The chapel was finally completed a few days before its formal dedication on Alumni Day, November 23, 1954. Its fiftieth anniversary was appropriately observed on Alumni Day, October 21, 2004. The shape of the chapel is cruciform. The nave constitutes the long axis while the main sanctuary, linked to the Mary Chapel and St. Joseph Chapel, are the cross arms. The internal space is composed of cast stone with terrazzo marble floors and marble columns. The nave contains twelve major stained glass windows above six banks of oak pews in a classic choir arrangement. Lighting is with recessed nave lights and bronze chandeliers. The choir loft has a stone balustrade reminiscent of that on the main building. Above and on either side of the sanctuary are two small galleries for visitors. The nave ceiling is stenciled with a green Greek key design and the ribs of the vault are decorated with ornamental alternating square and rectangular gold leaf figures. The exterior of the chapel is made of Indiana limestone. It has a pitched main roof over the nave and sanctuary, and a second flat roof over the colonnaded side aisles and side chapels. Two large bell towers above the galleries had originally been planned, but never completed. 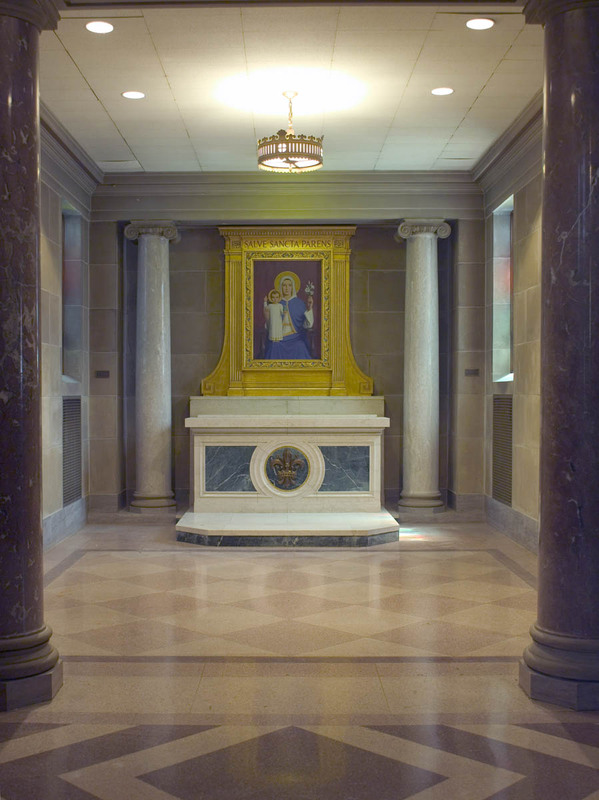 The SEDES SAPIENTIAE (Our Lady, Seat of Wisdom) statue is the focus of attention in the chapel’s atrium with its dramatic skylight, terrazzo marble floor and ornamental recessed oak ceiling. The statue itself is the most recognized and beloved symbol of St. Mary’s Seminary. It is, in fact, a replica of the original located at the Sulpician Seminary in Angers, France. Henri Bouriché, a prominent French sculptor, was commissioned in 1860 to carve a statue of the Blessed Mother for the seminary in Angers under her title as the Queen of the Sciences. 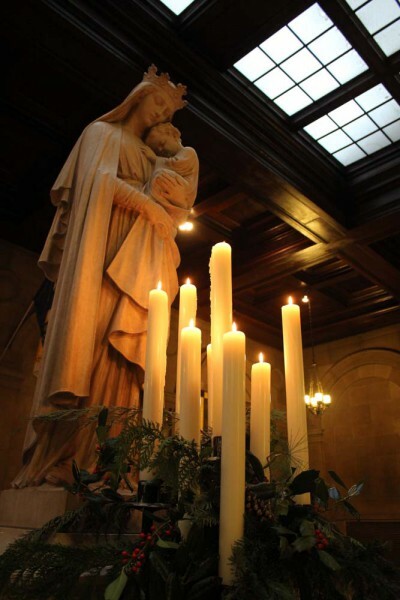 The regal dignity and maternal love expressed by the statue radiate peace throughout the space. This particular statue was soon embraced by the entire Sulpician community and can now be found in Sulpician institutions in France, Canada, and the United States. St. Mary’s SEDES SAPIENTIAE statue was installed in the atrium in November 1937, long before the chapel itself was actually completed. It was a gift of two priest alumni: Rev. John S. Cuddy (Class of 1905) and Rev. Michael J. Cuddy (Class of 1923) in memory of their aunt, Winifred Cuddy. The statue, made of Champville marble, and the pedestal, made of Botticino marble, were both executed in the Daprato studios in Italy. Over the side doors of the atrium are two Latin eucharistic inscriptions, CALIX NOVI TESTAMENTI (Chalice of the New Covenant) and PANIS VIVUS DE COELO (Living Bread from Heaven), with the corresponding images of the chalice and ciborium. In the 1990s, four large oil paintings, previously on display in the Prayer Hall and Refectory, were hung in the atrium. Two were gifts to St. Mary’s of the Maryland Historical Society in 1937, a copy of Titian’s Martyrdom of St. Peter Martyr (1852), and a copy of Domenichino’s Last Communion of St. Jerome (1853). Two other paintings, both by Enrico Bartolomei di Fuligno, Capranicus’, St. Nicholas of Tolentino in Ecstasy (1758), and Vision of St. Augustine (n.d.), Italian school, seventeenth century, were originally given in 1824 by Cardinal Joseph Fesch, prefect of Propaganda Fide, as a gift to Archbishop Ambrose Maréchal, S.S., of Baltimore to decorate the Cathedral of the Assumption of the Blessed Virgin Mary. They were later donated to St. Mary’s Seminary. The flags placed in the atrium are the colonial and current flags of the United States of America, the Papal flag, and the flags of St. Mary’s Seminary and University, the State of Maryland, and the City of Baltimore. Over the three doorways leading into the chapel proper are three coats of arms and three titles of Mary. The coats of arms from left to right are of Pope Pius XII, with the Latin inscription REGINA PACIS (Queen of Peace); St. Mary’s Seminary and University with the Sulpician motto, AUSPICE MARIA (With Mary as Protectress); and Archbishop Francis P. Keough of Baltimore with the inscription REGINA CLERI (Queen of the Clergy). The arms of the Pope and Archbishop indicate when the chapel was completed. The vestibule between the atrium and the chapel nave is known as the narthex. 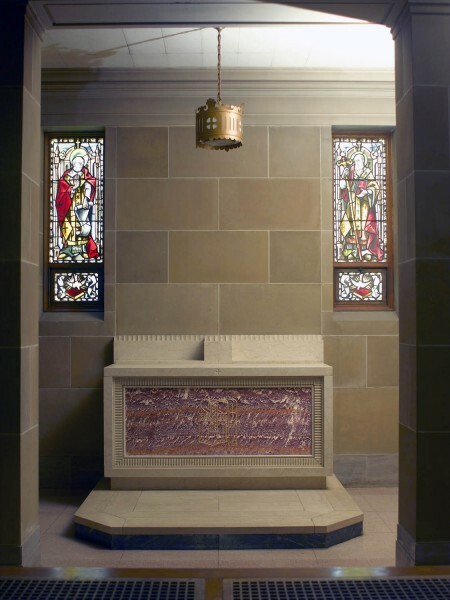 On the far left is a small stained glass window that sets the theme and purpose of the chapel: the priesthood of Jesus Christ. This striking image comes from the Letter to the Hebrews where Christ is described as the Great High Priest. The large panel depicts Christ in gold and green priestly vestments for Mass. The small panel employs images of grapes and sheaves of wheat, symbols of the Eucharist. Above the central entrance to the chapel is a stone panel dedicated to the Holy Trinity. Composed of a large circle with two internal triangles, the panel includes symbols for the Father, Son, and Holy Spirit together with the Hebrew letters for the Holy Name of God in the Old Testament, Yahweh, and the Greek letters Alpha and Omega to denote Christ in the New Testament. Encircling these symbols are the Latin inscriptions UNA DEITAS GLORIA TIBI (Glory to you the one God), AEQUALIS TRINITAS (Equal Trinity). At the bottom are the words TE DEUM LAUDAMUS (We praise you God). The panel corresponds to the mural on the far sanctuary wall which completes the TE DEUM LAUDAMUS motif with images of Christ and the saints. The small statues of carved wood of the four Evangelists, originally in the Our Lady of the Angels Chapel of St. Charles College, were also located in the narthex. On the wall just to the left of the chapel entrance is a bronze plaque commemorating the visit of Pope John Paul II (1978-2005) to St. Mary’s Seminary on October 8, 1995. 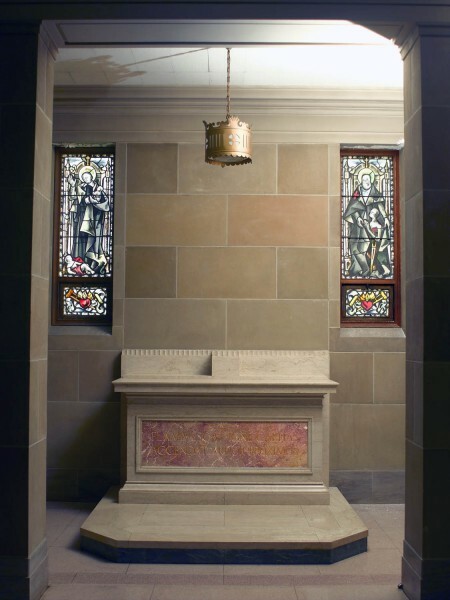 The pew in which the Holy Father prayed privately is marked with a small plaque and a Latin inscription. Above the three sets of doors leading back from the narthex into the atrium are three coats of arms. On the far left is the shield of Archbishop Michael Curley (1879-1947), in the center, St. Mary’s Seminary and University (1791), and on the right, the coat of arms of Archbishop John Carroll (1735-1815). They recall the foundation of the seminary under Archbishop Carroll and the building of St. Mary’s, Roland Park, under Archbishop Curley. To the right, is the door leading to the organ and choir loft. The nave of the chapel is forty-eight feet wide and fifty-seven feet high. The walls are of cast stone and the pillars of Missouri marble. The six banks of oak pews are arranged in choir style to facilitate the recitation of the Divine Office and antiphonal chant. The two rows of pews facing forward in the back of the chapel were for seminary faculty. The distance from the entrance to the chapel to the first step of the sanctuary is one hundred feet six inches. The chapel can accommodate 400 persons. located on the walls between the stained glass windows and on the rear wall of the chapel. The carved marble stations were commissioned by the firm of Galassi-Hutton of Brighton, Massachusetts, which also did other work in marble for the chapel. In the first side chapel on the right is a small confessional. Inscribed above the lintel on leaving the chapel are the words from the Emmaus Story in the Gospel of Luke MANE NOBISCUM DOMINE (Remain with us, Lord). Inscribed on the great arch at the end of the nave and marking the entrance to the sanctuary proper are the words ELEGIT EUM DOMINUS SACERDOTEM SIBI AD SACRIFICANDUM ET HOSTIAM LAUDIS (The Lord chose for Himself a priest who would offer to Him a sacrifice of praise). 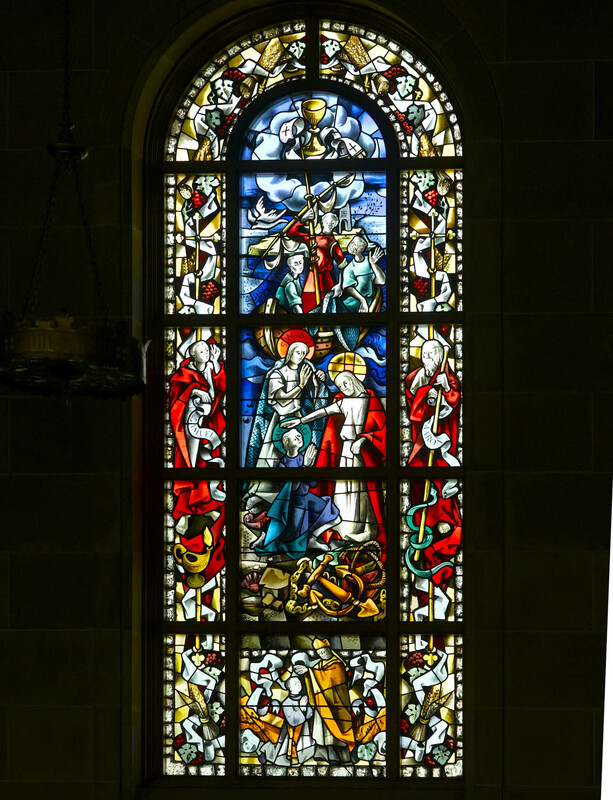 The chapel contains altogether eighty-one stained glass windows designed and executed by the Max Ingrand studio in Paris and are the first examples of his work in the United States. 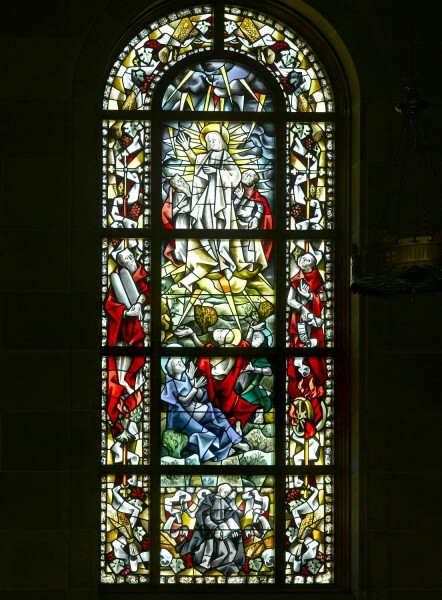 Later, Ingrand also designed the windows for the Cathedral of Mary Our Queen completed in 1959. Most of the windows are visible from the main body of the chapel, but nine smaller windows can be found in the sacristy and others in the three staircases and two galleries. The twelve windows in the nave, Palladian in shape and comprising four elements, all emphasize the life and ministry of Christ as well as the ministry of the priest. 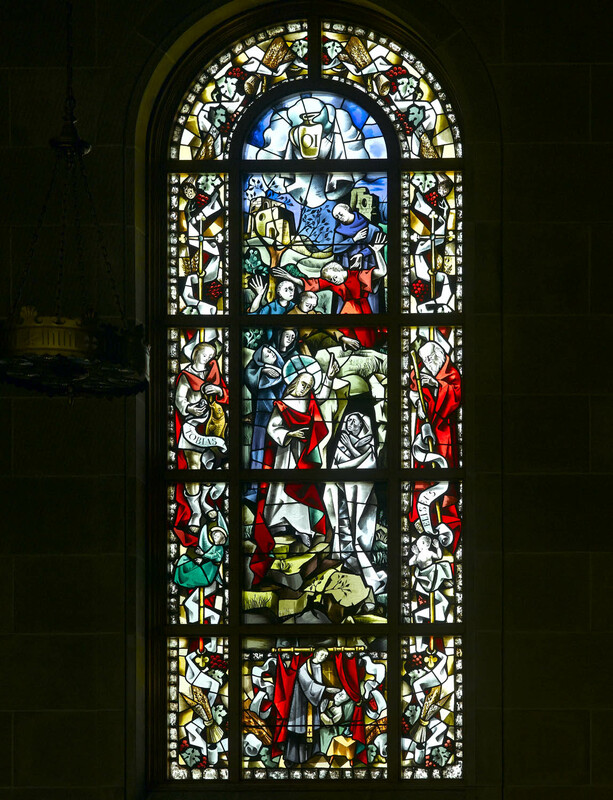 In each window, the large central panel depicts a familiar scene from the New Testament. This is flanked on side panels by figures and symbols from the Old Testament which prefigured these realities. The small panels at the bottom depict corresponding scenes from the ministry of the priest which are bordered by symbols supporting the overall theme. The extraordinary symbolism in the large stained glass windows begins by the sanctuary on the right and envelops the chapel to the sanctuary on the left. 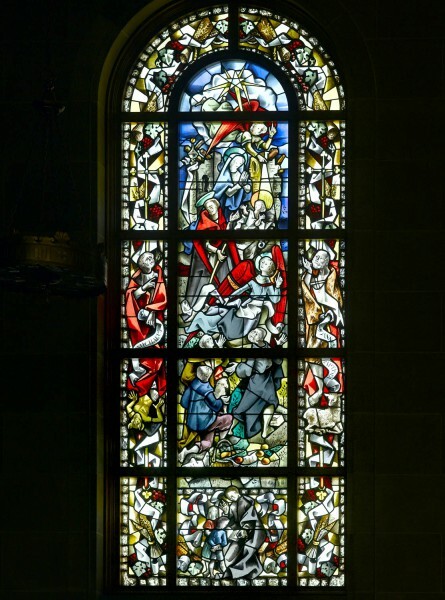 The windows recount the narrative sequence of major episodes from the Gospels and Acts beginning with the Nativity of Christ and concluding with the birth of the Church at Pentecost. What is unique and most unusual about them is the parallelism between the biblical figures in the large panels and corresponding motifs in the life and ministry of priests in the lower panels. I. The Nativity Window depicts the Christmas scene with Mary and St. Joseph as well as the shepherds visited by an angel. The prophet Micah, who prophesized a Messiah to be born at Bethlehem, and St. John the Baptist, who prepared the way for the Lord, are depicted on either side. In the lower panel, a priest instructs children. II. The Epiphany Window depicts the magi from the East who followed the star to Bethlehem and offered their gifts to the newborn King. On each side are the prophets Haggai and Malachi. The lower panel emphasizes the priest’s role in evangelization. It features two famous missionary priests from the first part of the twentieth century with connections to St. Mary’s and the Archdiocese of Baltimore — Father Howard Bishop, who founded the Glenmary Home Missioners, and Bishop James Walsh, co-founder of Maryknoll. They stand beside a globe with the cross, the symbol of mission work. III. The Wedding Feast of Cana Window reflects the story of the miracle of the water changed into wine at Cana in the Gospel of John. On either side are the prophet Hosea and Sarah, the wife of Abraham The ruby abundance of wine is dramatically illustrated. At the top are two rings and the Greek letters Chi-Ro (X R), the symbol of Christ, superimposed on the bands of marriage. In the lower panel a priest bestows the nuptial blessing. IV. 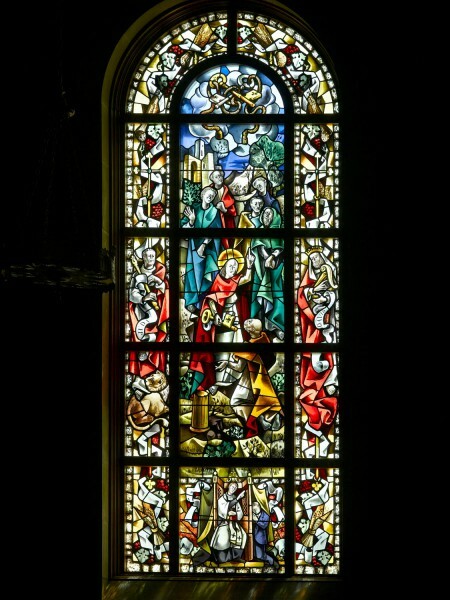 The Calling of the Apostles Window shows Jesus choosing James and John, the sons of Zebedee, who became his first followers, two among The Twelve, and the origin of the ministerial priesthood in the New Testament. On either side panel are Samuel and Aaron, priests of the Old Testament. Above the scene are two signs of the priesthood, the stole and chalice. The lower panel is a priestly ordination scene. 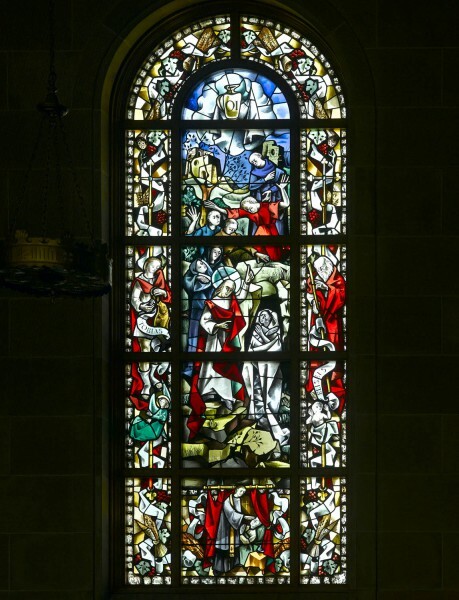 V. The Christ and Lazarus Window depicts the raising of Lazarus from the dead in the Gospel of John. On either side are Tobias and Elisha, Old Testament figures associated with resurrection. The oil vessel in the top panel emphasizes the anointing of the sick. The lower panel shows a priest anointing the sick. VI. The Transfiguration Window spectacularly captures the glory of the Transfiguration recorded in all three Synoptic Gospels. In an anticipation of the resurrection, Jesus was transfigured before Peter, James, and John. On either side are Moses and Elijah, figures of the Law (two tablets) and the Prophets (fiery chariot) respectively, who appeared with Christ on Mount Tabor. The lower panel shows the priest reading the Divine Office, symbol of his life of prayer. VII. The Giving of the Keys Window records the famous scene in Matthew 16 when Jesus bestowed the keys to the Kingdom of Heaven on Peter and the power of binding and loosing. On either side panel are Judah (lion) and David, judges and kings in the Old Testament. In the lower panel, the priest raises his hand in absolution as part of the sacrament of reconciliation. VIII. The Last Supper Window shows the Last Supper and the institution of the Eucharist with its intrinsic link to the ministerial priesthood. On the side panels are the Old Testament figures of Melchizedek and Abel, figures of the priestly office and sacrifice. In the lower panel is a scene depicting a priest distributing communion at Mass. IX. 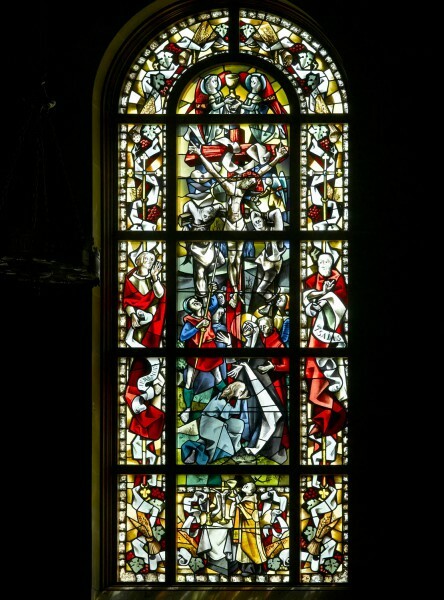 The Crucifixion Window dramatically portrays the death of Christ on the cross. In this act, as the liturgy says, Christ is both priest, altar, and the lamb of sacrifice. On either side panel are Jeremiah and Isaiah, prophets who wrote of innocent suffering. Also depicted is a symbol of this sacrifice, the chalice containing the blood of Christ. The lower panel shows the priest celebrating Mass representing the sacrifice of the cross in the form of bread and wine. X. 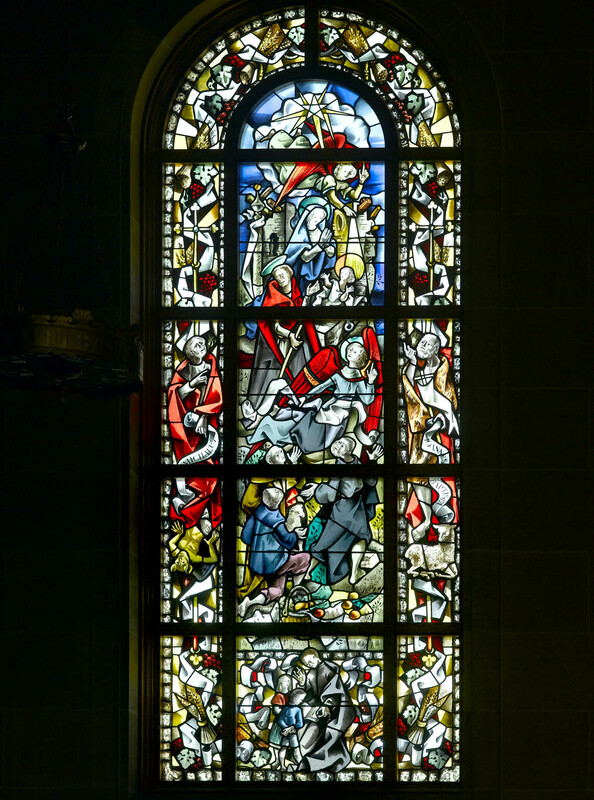 The Resurrection Window depicts the scene of Easter and the appearance of the Risen Christ to the disciples. Above Christ are the lamb and the banner, symbols of his victory, while on either side panels are the prophets associated with the conquest of death, Jonah and Enoch. 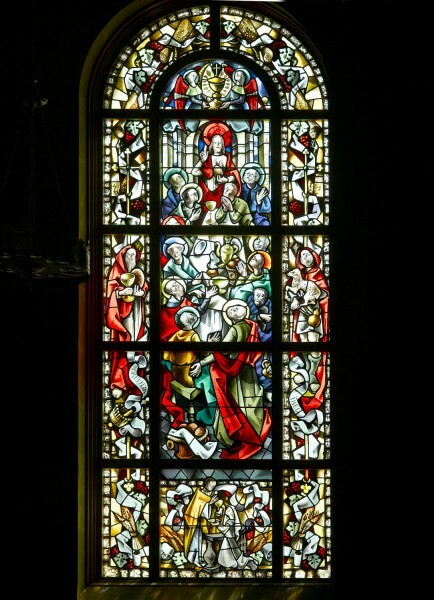 In the lower panel, the window connects the resurrection to the priest’s administration of Baptism. XI. 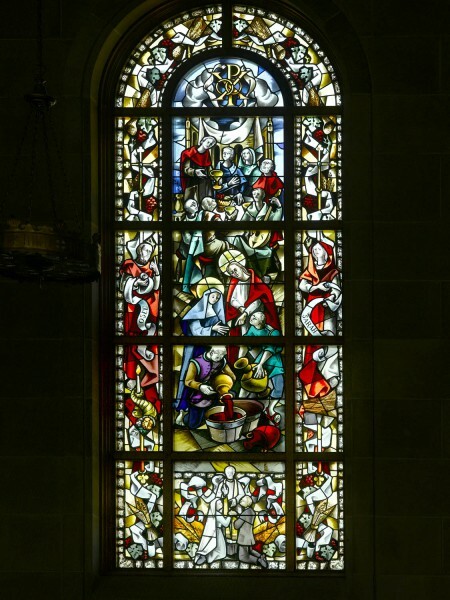 The Commissioning of the Apostles Window recalls the New Testament scene of Jesus’ final commissioning of his apostles after the Resurrection to “Go teach all nations.” Above the scene are the symbols of apostolic teaching, the Book and the Lamp. On either side panel, two prophets look on, Ezekiel (temple) and Daniel (lion). In the lower panel, we see the priest carrying out the mission of Christ by preaching and the ministry of the word. XII. 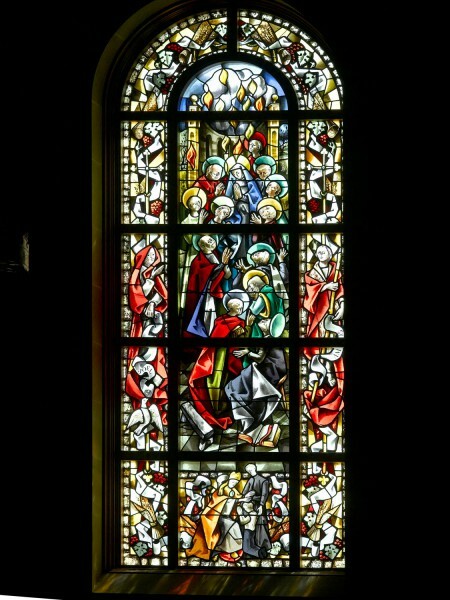 The Pentecost Window recounts the Feast of Pentecost and the birth of the Church when the Holy Spirit descended upon the Apostles and Mary in the form of tongues of fire. On either side panel are Joel and Amos, prophets of the out-pouring of the Spirit. In the lower panel the Sacrament of Confirmation is represented thus completing the threefold sacraments of initiation into Christ. The organ was designed and executed by the Casavant Frères Organ Builders of St. Hyacinthe, Quebec, Canada. Altogether over two thousand pipes comprise the full tonal range of the organ. The pipes measure in width from a fraction of an inch to over eight inches. The longest pipe is sixteen feet. These pipes, some made of wood, allow the organ to produce the sounds of almost any musical instrument – a harp, viola, flute, trumpet, clarinet, and oboe. It also contains an exceptionally beautiful set of mellow chimes. Father John Selner, S.S. (1904-1992), who served as the seminary’s organist for many years, worked closely with Casavant Frères to create the organ for St. Mary’s. The sanctuary is elevated by four steps from the main aisle with its distinctive chevron design. The High Altar. The high altar is of Botticino marble carved with lilies at each end. In the center, the words are inscribed and highlighted in gold leaf OBLATUS EST QUIA VOLUIT (He was offered because He willed it). The tabernacle is of bronze and made in Italy. In front it bears the inscription ECCE AGNUS DEI (Behold the Lamb of God) and with two cherubim bowing in adoration. On the sides are the inscriptions SANCTUS (Holy). The main crucifix of carved wood is from the Irving & Casson Studio in Boston. The cross arms contains the classic symbolic representations of the Four Evangelists – Matthew as the Man; Mark as the Lion; Luke as the Ox; and John as the Eagle. Protectress). The Latin words MAGNIFICAT ANIMA MEA DOMINUM (My soul gives glory to the Lord) from Mary’s canticle in Luke are inscribed with gold leaf on the baldachino directly over the point where the main cross is suspended. Altar and Ambo. 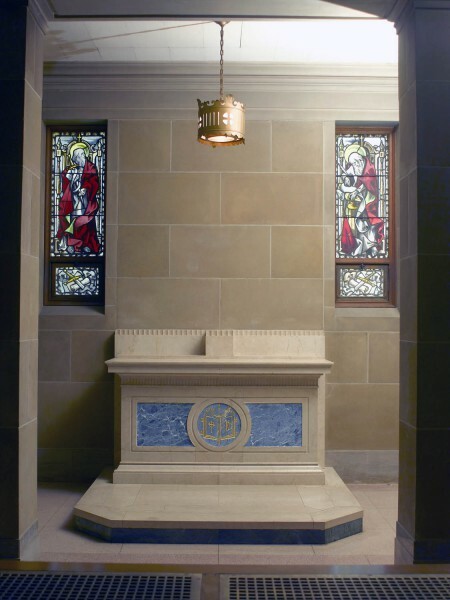 In 2002 an altar of sacrifice and matching ambo were designed by William Gaudreau and placed in the chapel. They recall the repeating lily design in the railings of the two galleries above and on either side of the sanctuary as well as those carved in the marble high altar. The new altar and ambo are made of white marble to complement the high altar. A new presider’s chair and accompanying furnishings were added at the same time. Mural. The mural on the wall behind the high altar reflects the hymn, the TE DEUM, a hymn of praise to God sung as part of the liturgy and which is also evoked in the emblem at the entrance of the chapel. At the summit of the mural, surrounded by adoring angels, is Christ vested as High Priest with the cope and stole. He is raising one hand in blessing, while in the other hand he holds the orb of the world, the sign of his kingship. The images of the saints are arranged in three descending rows on either side and were chosen to match the categories of figures indicated in Latin hymn, TE DEUM. The top row – Te gloriosus Apostolorum chorus (The glorious chorus of Apostles praises you) – On the left side: (l to r) St. James, St. Matthew, and St. John; On the right side: (l to r) St. Peter, St. Paul, and St. Andrew. The middle row – Te martyrum candidatus laudat exercitus (The white-robed army of martyrs praises you) – On the left side side: (l to r) St. Lawrence, the early Roman deacon, St. Ignatius of Antioch, one of the great Fathers of the Church, and St. Agnes, the virgin-martyr; On the right side: (l to r) St. Maria Goretti, the Italian martyr of chastity, St. Isaac Jogues, the Jesuit missionary to North America, and St. John Fisher, the English Bishop of Rochester who was martyred under King Henry VIII. St. John Bosco, patron of youth work, with one of his protègés, St. Dominic Savio, who died at age 15, and St. Elizabeth, the Queen of Hungary, who amidst the splendor and riches of court life, led a life of charity, prayer, and mortification; On the right side: (l to r) St. Louis Grignon de Montfort, a French priest who dedicated his ministry to promoting the rosary and Marian devotion, St. Charles Borromeo, the Cardinal Archbishop of Milan, noted for his work of Church reform, the foundation of seminaries, and for his life of charity, poverty, and penance, St. Thomas More, patron saint of lawyers, layman and chancellor of England who was martyred under Henry VIII, and St. Isidore the Farmer, patron saint of rural life movements, shown here with his plow and the legendary angel who is supposed to have helped him with his work. This whole mural emphasizes the universality of the grace of Christ, who has called and drawn to himself individuals from all ages, conditions of life, and vocations as saintly witnesses and servants in the Church. On the lower left side of the sanctuary is the cornerstone inscribed with the date ANNO DOMINI MCMXLI (A.D. 1941) and with a verse from St. Paul identifying Christ Jesus himself as the cornerstone for the church. Above and on either side of the sanctuary are two small galleries for private participation in the Mass. For many years one was used by the Sisters of Divine Providence, who staffed the seminary kitchen and laundry for over seventy years. 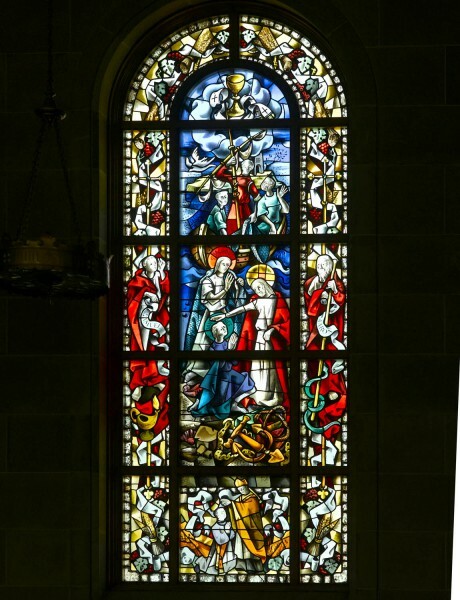 It contains three stained glass windows, one of which is dedicated to the sisters. Alongside it, a smaller window contains the image of a hearth and kettle. The other gallery contains three small windows dedicated to art, architecture, and building crafts. 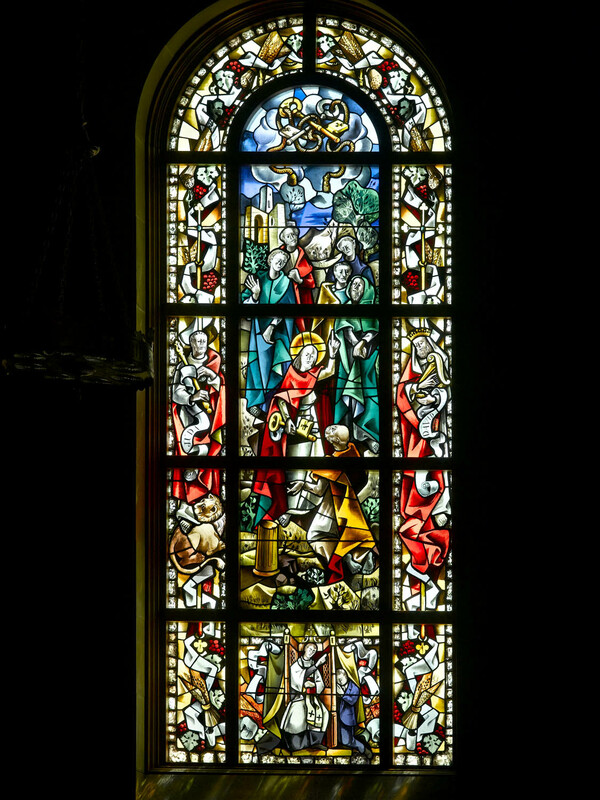 The central window depicts the Basilica of the Assumption. The Latin inscriptions carved in stone beneath the galleries on either side of the sanctuary are phrases taken from the ordination rite for priesthood and form part of the instruction of the bishop to the ordinandi: On the left, AGNOSCITE QUOD AGITIS (Know what you are doing) and, on the right, IMITAMINI QUOD TRACTATIS (Imitate what you handle). Two side aisles, with marble and stone colonnades, run alongside the nave of the chapel and open onto fourteen side chapels. Prior to Vatican II, which restored the ancient practice of priestly concelebration, each side chapel was assigned to a Sulpician faculty member for private daily Mass while the rector celebrated Mass at the high altar for the seminarians. The theme of the priesthood is exemplified in the side chapels in their dedication, inscriptions, other designs, and stained glass windows. The side chapels, beginning from the left and surrounding the nave to the right begin with the Mary Chapel and end with the St. Joseph Chapel. Both larger chapels are identified by portraits on wood panels of Mary and Joseph. 1. Chapel of the Blessed Mother. The first chapel on the left side of the sanctuary is dedicated to the motherhood of Mary. The Latin inscription over the painting, SALVE SANCTA PARENS, (Hail Holy Mother) expresses that theme. The altar contains a bronze fleur de lis with a crown symbolizing Mary’s Queenship. The chapel was completed in 1954, the centenary of the definition of the dogma of the Immaculate Conception and four years after the definition of the Assumption in 1950. The painting was done by Mr. Bernard Keyes of Boston. The window on the left shows Mary in her appearance to St. Bernadette at Lourdes, while the window on the right depicts the Presentation of Mary in the Temple, the Sulpician patronal feast. The lower sections of the windows show the main façade of Roland Park and the chapel of the old seminary on Paca Street, emphasizing the continuity of the two campuses. Two small plaques memorialize parents of benefactors, Annita France and Anne Merrick. Shrine to the Pieta. 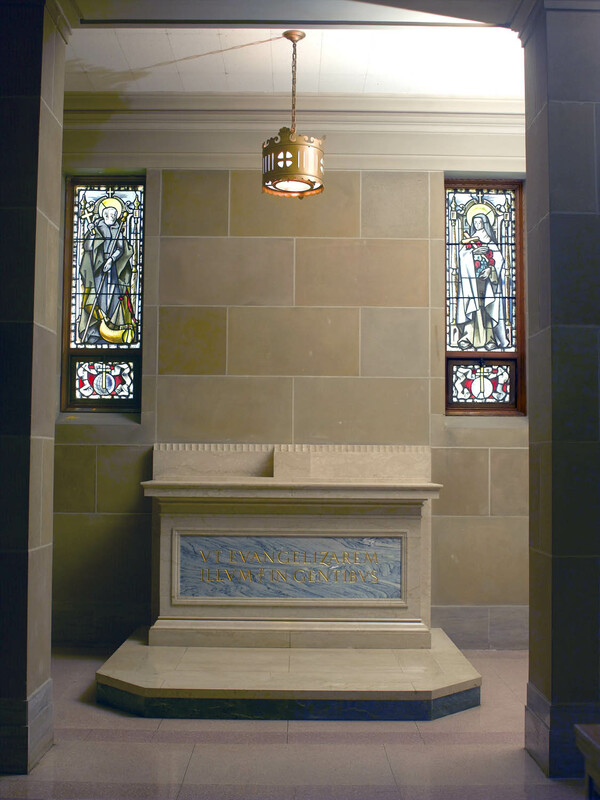 Next to the chapel of the Blessed Mother is a small niche with a statue of the Pieta and the Latin identification. ALUMNIS PRAETERITUS TAM VIVIS QUEM DEFUNCTIS QUI MUNIFICENTIA SUA HOC SACELLUM EXERGERUNT (This shrine is given through the generosity of alumni both living and dead). 2. Chapel of St. Peter. The chapel is dedicated to St. Peter, the first of the Twelve Apostles and the first Pope. The sign of the papacy is shown on the altar (tiara and crossed keys), while the windows show St. Peter holding the keys of the kingdom of heaven and preaching in Jerusalem on the first Pentecost. 3. Chapel of St. John. 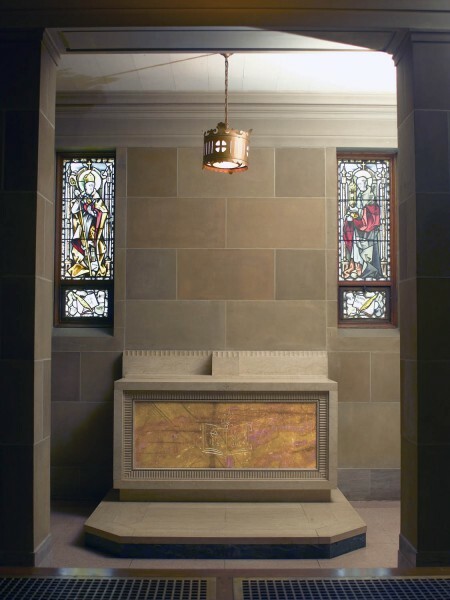 The chapel is dedicated to St. John the Divine, the name of the Evangelist and the author of the Apocalypse. On the altar is the eagle, the symbol of St. John. The windows depict him traditionally standing with the chalice on the left and on the right composing his visions for the Apocalypse with the figure of Mary and her Child in view. 4. Chapel of Western Doctors. The chapel is dedicated to the doctors of the Western Church. St. Augustine of Hippo, the patron saint of theologians, and St. Thomas Aquinas, the patron saint of Catholic schools and universities. Augustine’s DE CIVITATE DEI (City of God) and Thomas’ SUMMA THEOLOGIAE (Summa of Theology) are indicated. The front of this altar shows the book symbolizing learning and the words IN MEDIO which are the opening words of the Introit of the Mass of Doctors (In the midst of the Church He opened His mouth and the Lord filled him with the spirit of wisdom). 5. Chapel of Martyrs. This chapel is dedicated to all the martyrs who since the beginning of the Church have given their lives in witness to their Christian faith. The inscription on the front of this altar is taken from the divine office and the Book of Wisdom for the feast of many Martyrs QUASI HOLOCAUSTA ACCEPIT EOS IN AETERNUM (As holocausts Thou hast received them into eternal life) The windows of this chapel show, on the left, St. Stephen, the first martyr, and on the right, the names of the Sulpician martyrs who died during the French Revolution. The Sulpician martyrs were beatified by Pope Pius XI in 1926. The lower panel of each of these windows shows the palm, symbol of victorious martyrdom. 6. Chapel of St. Sulpice. The chapel honors the Priests of St. Sulpice. The window on the left depicts St. Sulpice, a seventh century French bishop known for his holiness and charity. He is holding a miniature of the Church of St. Sulpice in Paris from which the Suplicians take their name. 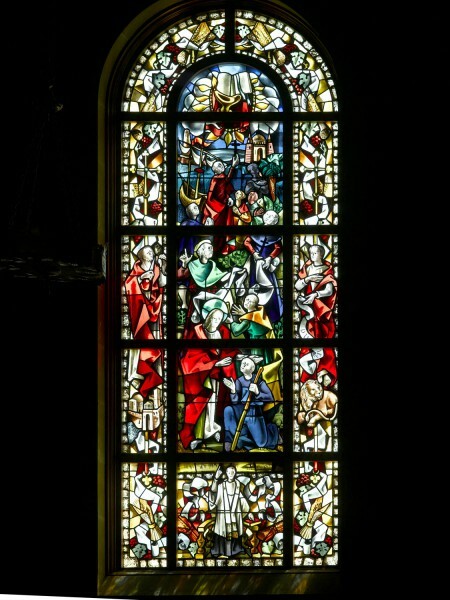 The window on the right depicts Jean-Jacques Olier, S.S, founder of the Sulpicians, together with Jacques-Andre Emery, S.S., the Superior General who sent the first group of Sulpicians to Baltimore in 1791, and François Nagot, S.S., the leader of that band and first superior of St. Mary’s. Father Nagot is shown holding a replica of the One Mile Tavern, which served as the first home of the seminary. Beneath both windows are found the symbols for France (the rooster), the United States (the eagle), and the Society of St. Sulpice (Sulpician coat of arms), emphasizing the connection between France and America through the Society of St. Sulpice. On the front of the altar is an inscription taken from the opening words of the Pietas Seminarii Sancti Sulpitii, a set of principles drawn up by Father Olier for the piety that was to characterize priestly training in his seminary VIVERE SUMME DEO IN CHRISTO JESU (To live fully for God in Christ Jesus). 7. Chapel of the Missions. The chapel is dedicated to the missionary saints of the Church. The patron saints of the Missions, St. Francis Xavier and St. Thérèse of the Child Jesus. St. Francis is pictured with a ship that symbolizes his missionary journeys to India, Japan, and China. St. Thérèse is shown with roses, symbol of her love for the world. Beneath the saints there is the symbol of world missions: the globe with a superimposed cross. On the front of the altar is an inscription taken from the writings of the great missionary apostle, St. Paul, which summarizes the motive of every missionary, UT EVANGELIZAREM ILLUM IN GENTIBUS (That I may make Him known among the Gentiles). 8. Chapel of Priestly Charity. 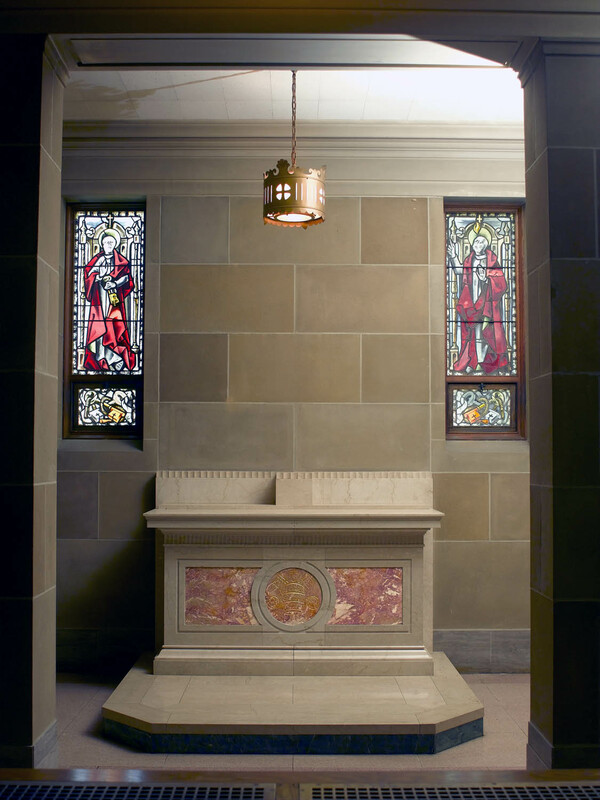 The chapel is dedicated to those saintly priests who have emphasized the ministry of charity in their lives. St. Vincent de Paul and St. Camillus de Lellis were chosen to represent them. St. Vincent was the founder of the Daughters of Charity, the Ladies of Charity, and the Congregation of the Mission, all of which are dedicated to the work of caring for those in need. St. Camillus was the founder of the Camillan Fathers, a religious community dedicated to operating hospitals and nursing the sick. St. Camillus is also the patron saint of nurses. The inscription on the altar is taken from one of the hymns in the divine office, FLAMENESCAT IGNE CARITAS ASCENDAT ARDOR PROXIMOS (May our charity flame like fire; may its heat warm our neighbors). Beneath each window there is a symbol of fraternal charity — the flaming heart with superimposed crutch. 9. Chapel of Model Priests. The chapel is dedicated to the model priests of modern times exemplified by the saints pictured in the two windows: St. John Vianney, the Curè of Ars, and Pope Pius X. St. John Vianney is the patron saint of parish priests, noted for his zeal as a humble pastor and for his compassionate ministry as a confessor to which he devoted his life. St. Pius X is honored for his dedication to the Eucharist and frequent communion. He was canonized in 1954. Under the window of each saint is a symbol of priestly life: the book, the chalice, and the host. The inscription on the altar is taken from the Gospel of John, VENIUT VITAM HABEANT ET ABUNDANTIUS HABEANT (I am come that they may have life and have it more abundantly). 10. Chapel of Confessor Bishops. This chapel is dedicated to the honor of all those saintly bishops who by the holiness of their lives bore witness to Christ. They are exemplified by the two saints in the windows: St. Francis de Sales (left) and St. Martin of Tours (right). St. Francis was the Bishop of Geneva, Switzerland, who is the patron saint of the Catholic Press. St. Martin was the Bishop of Tours, France. The inscription on this altar brings out the ideal of the priestly life, SACERDOS MAGNUS QUASI IGNIS EFFULGENS ET THUS ARDENS IN IGNE (A high priest burning like a glowing fire and like incense burning in a fire). 11. Chapel of the Eastern Doctors. The chapel is dedicated to the doctors of the Eastern Church. St. Athanasius, Bishop of Alexandria and theologian at the Council of Nicaea, and St. John Chrysostum, an early patriarch of Constantinople, were chosen to represent them. Beneath the figures are the symbols of the eastern doctors: the book (symbolic of their learning and writings) and the dove (symbol of the Holy Spirit). On the front of the altar is a group of symbols in oriental form: the book, the eastern star, the priestly stole, and the first and last letters of the Greek alphabet (alpha and omega). 12. Chapel of St. John the Baptist. The chapel is dedicated to St. John the Baptist whose message was repentance in anticipation of the Messiah. 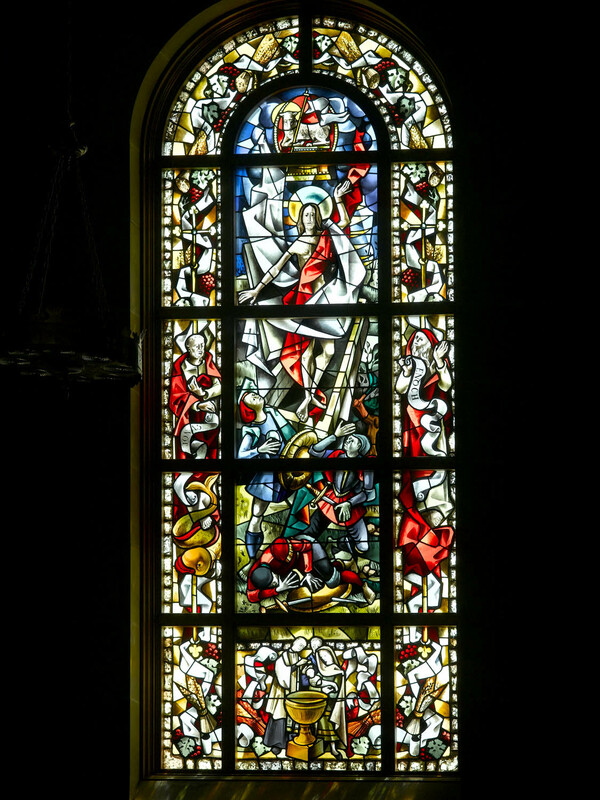 In the left window St. John is shown preaching repentance, while the right window recalls the scene of the baptism of Christ in the River Jordan. On the front of the altar is the lamb, the symbol for Christ given by John the Baptist in the Gospel of John, a shell (with which the waters of baptism were poured), and the word ECCE, the first word of the identification ECCE AGNUS DEI (Behold the Lamb of God). 13. Chapel of St. Paul. The chapel is dedicated to the great missionary saint, the Apostle to the Gentiles. He preached the gospel throughout Asia Minor, Greece, and Rome, and is the canonical author of fourteen letters in the New Testament to individuals or to various churches he founded. In the left window, he is shown holding the traditional symbols, the book for writing and the sword by which he was martyred. In the right window, Paul is shown writing one of his letters. On the front of the altar are repeated the symbols of his life: the book and the sword. Shrine to the Good Shepherd. This niche and shrine has a statue of the Good Shepherd with the carved Latin inscription for the pastoral ministry of priests, PRESBYTERI QUI OLIM IN HOC SEMINARIO STUDIUM OPERAMQUE NAVARUNT IN PASTORIBUS BONIS FORMANDIS (Priests who have gone through study and work in this seminary to be formed in the model of the good shepherd). 14. Chapel of St. Joseph. 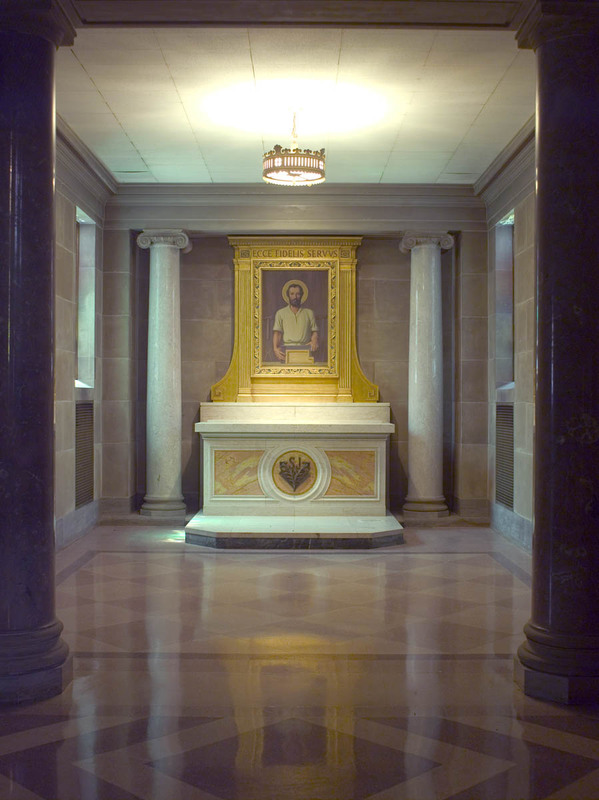 The last of the side chapels is dedicated to St. Joseph, Mary’s husband and patron of the Universal Church. He is depicted as a carpenter in the painting by Bernard Keyes. The inscription reads ECCE FIDELIS SERVUS (Behold, the Faithful Servant). The bronze lily, symbol of St. Joseph, is represented here superimposed on a carpenter’s tool. The window on the left portrays the Flight into Egypt. 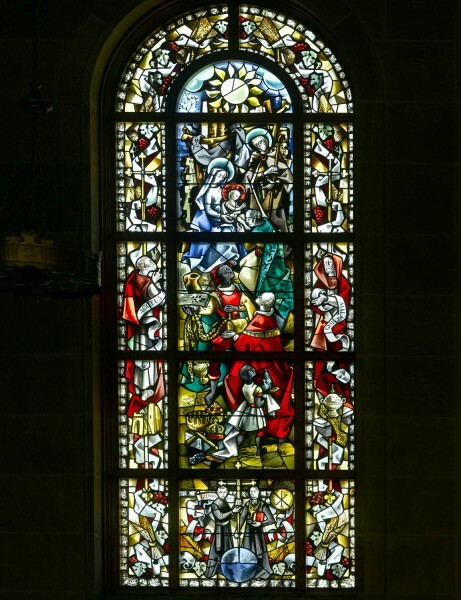 The other window shows St. Joseph as the model of purity. Beneath the windows are featured the foundresses of two women’s religious communities with close connections to St. Mary’s, St. Elizabeth Ann Seton (1774-1821), who founded the Sisters of Charity of St. Joseph, now the Daughters of Charity, and Mother Mary Elizabeth Lange (c.1784-1882), who founded the Oblate Sisters of Providence, the first religious community for women of color in this country. The main sacristy is located behind the sanctuary and high altar. 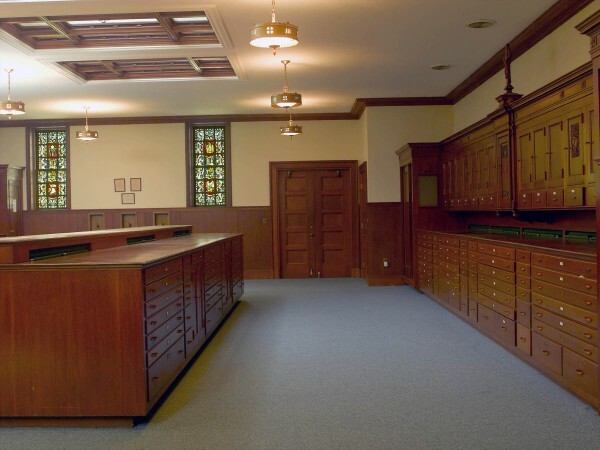 It is beautifully executed in oak with fifteen vesting cases, large drawers, and cabinets which hold the liturgical vestments, books, and other articles used in the liturgy. The millwork is extraordinarily rich and detailed. There is a large skylight over the main vesting case. On either side of the main sacristy are two small work sacristies. 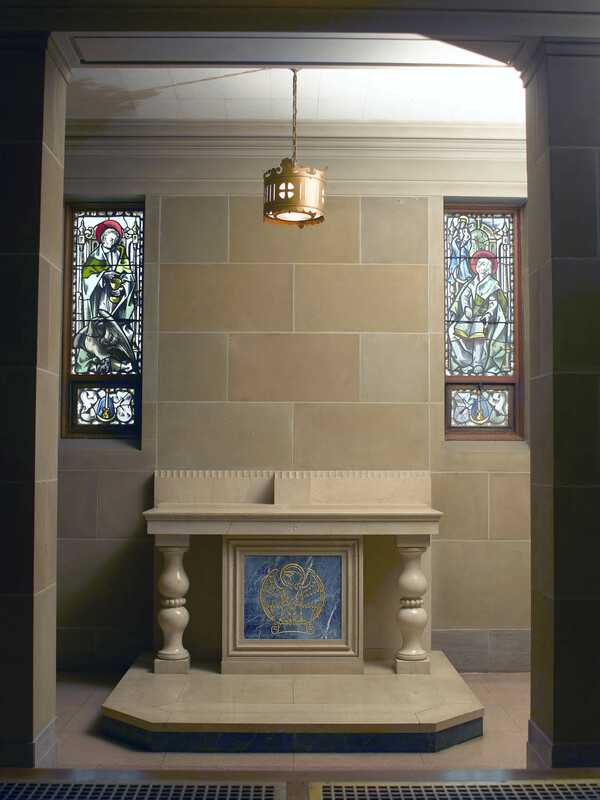 The sacristy contains nine stained glass windows with many symbols of the Priesthood, Mary, and the Eucharist. One window contains the famous image of the pelican, symbol of Christ feeding his people with his own blood. The symbols represent many titles of Mary drawn from the litanies — Mary as Ark of the Covenant, Seat of Wisdom, Gate of Heaven, Refuge of Sinners, Vessel of Devotion, Queen of Martyrs, Queen of Prophets, and Queen of All Saints. In the main sacristy, Mary is portrayed as Queen of the Clergy. The lower parts of the sacristy windows portray the various minor orders, with the priesthood occupying the center window. The outside walls of the chapel contain four inscriptions relating to the priesthood. All are taken from the Gospel of John and Jesus’ lengthy address to the apostles following the Last Supper. 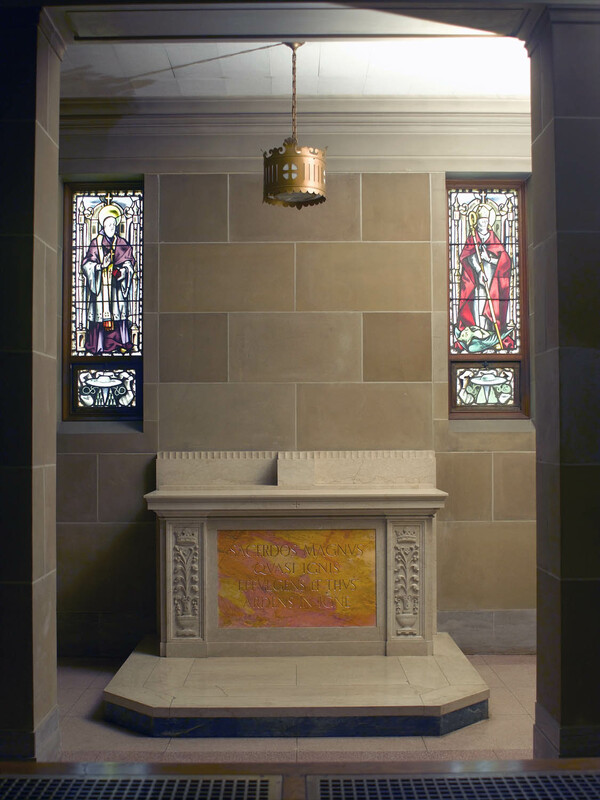 On the west side of the chapel are the words: SANCTIFICA EOS IN VERITATE (Sanctify them in the truth). On the east side are the words: SERVA EOS IN NOMINE TUO (Serve them in your name). On the large south wall of the chapel is the inscription: (top) EGO ELEGI VOS ET POSUI VOS UT EATIS ET FRUCTUM AFFERATIS ET FRUCTUS VESTER MANEAT (I have chosen you, and appointed you that you may go fourth and bear fruit and that your fruit will remain). On the external wall of the small apse in the sacristy are the words: IAM NON DICAM VOS SERVOS VOS AUTEM DIXI AMICOS (I no longer call you servants but friends). 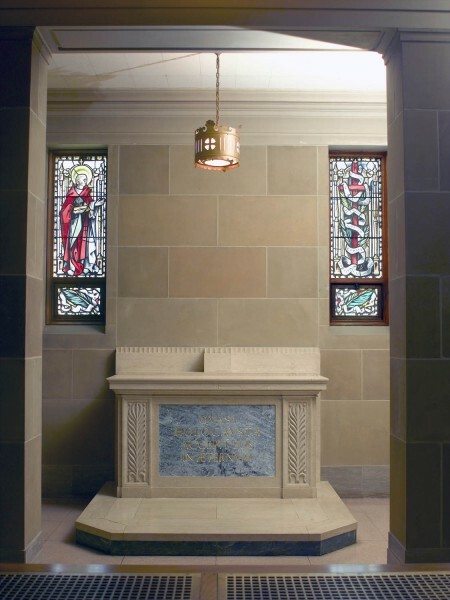 The Chapel of St. Mary’s is a beautiful, uplifting and enduring tribute to the love for Christ, Mary, and the Priesthood that has animated the traditions, life, and ministry of the Priests of St. Sulpice. It is the spiritual soul and architectural heart of St. Mary’s Seminary & University.